On September 7th, 8th and 9th, 2012 William H. Dentzel's 10 rider, 20 foot diameter handcrank/electric powered "Flying Horses" carousel was set-up in the Children's Bay area at the Port Townsend Wooden Boat Festival. There was a Brass Ring Catching Game with the carousel for child or adult riders to play. One Dollar per ride was charged, many rides, some very long, were given. Free rides were also given under certain circumstances. Ideally the carousel would be sponsored by some businesses or groups so that all children could ride for free. The carousel would be full throughout the festival and parents would be richly rewarded. Please contact Bill Dentzel at 360-531-2812 to discuss this possibility. In1994 & 1995 MGR#6, the Carousel of the Olympic Sea (now in Waveland, Mississippi), operated at the Wooden Boat Festival. At PTWBF-1997-1998-1999 MGR#8 operated at the festival before spending six years operating in Hopland CA. 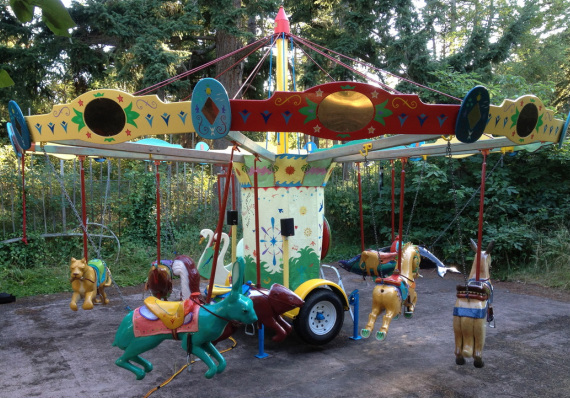 At PTWBF-2000 MGR#4, a foot-pedal carousel, operated in Pope Marine Park, it now operates in Yelm WA. Double Swan Chariot with 8 other animals. Set-up at Dentzel Carousel yard. Cougar, Turkey, Rabbit, Skunk, Kangaroo, Horse, Salmon, Humpback Whale, etc.